A lot of us here are a statistic....you're in good company. Anyway, I'm glad you are over the worst...your nerves will come back in time. A lot of nice bikes - some familiar, some new - good to see them all. to TMW, and back to riding! I'm glad to hear you're doing ok after your crash. That was quite a curve, I guess. Thanks for the welcome. Lovin' the support from you all. I'm feeling very confident riding this season, other than I'm a still little shy on left turns since my accident last fall. When the weather stabilizes and I can get some real miles on my bike, I plan on workin' that left curve/corner over and over till I get it out of my system. Thanks for the compliment on my bike- I think it's just too much since it came out of the shop! Love it's new seat, bags, chrome stuff and windshield. Took off the back seat and LOVE it's profile now! I spent 2 months on E-Bay this winter getting parts for the damage. Then I got hooked and couldn't stop shoppin'! 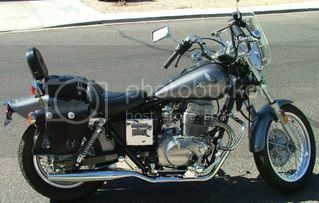 Got a cool leather jacket, digital video camera, Yamaha repair manual ( just in case)! Somebody stop me! Finally got the wife off the back of the bike and into the drivers seat and she is loving it. I reluctantly let her ride my GSXR 750. Its time to get her, her own. I will post pic were going shopping this week. Then I got hooked and couldn't stop shoppin'! You may be single-handedly repairing our economy! Don't stop! I'm not too sure about that.....I do my fair share to keep the economy rolling along. I have to admit I do, too! Maybe the role of women as guardians of the economy has been underrated! cyclebiker wrote: Finally got the wife off the back of the bike and into the drivers seat and she is loving it. I reluctantly let her ride my GSXR 750. Its time to get her, her own. I will post pic were going shopping this week. Actually, it would be better - preferred really - if you'd let YOUR WIFE post pics and say howdy. This is the LADIES forum. You blue bike and face shield stand out so nicely against the desert colours. blues2cruise wrote: You blue bike and face shield stand out so nicely against the desert colours. Dang! That helmet is amazing! Sorry about your dog messing with your look! If you can't find blue boots, dye a pair blue. Hi All, I've been lurking about and this is such a great forum! Very jice bike. You are fortunuate to have found a Rebel 450. I am new to this site but am so impressed with the amount of women that ride! +1 on the Rebel 450. I always liked the fact that they went with a parallel twin in lieu of the obligatory vee twin. It gives it a very nice unique look to it. Hey ladies! I'm a new rider still, this is my first summer but I'm really enjoying learning new things about riding. 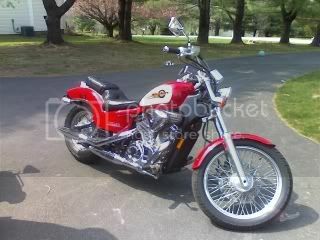 This is my beautiful Honda shadow that i bought last year after i completed my MSF course. can't wait to see you all out on the road! Wow, we ladies have some gorgeous bikes!! $hadow wrote: Hey ladies! I'm a new rider still, this is my first summer but I'm really enjoying learning new things about riding. This is my beautiful Honda shadow that i bought last year after i completed my MSF course. can't wait to see you all out on the road!